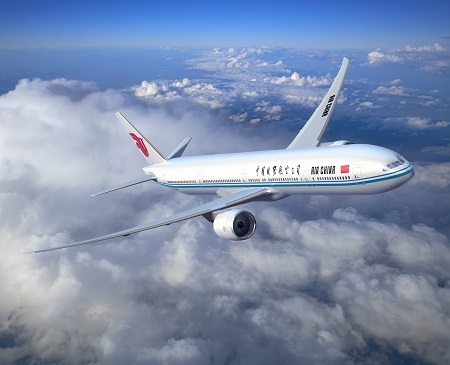 Boeing [NYSE:BA] and Air China today announced an order for six additional 777-300ER (Extended Range) jetliners. SEATTLE, Jan. 7, 2016 – Boeing [NYSE:BA] and Air China today announced an order for six additional 777-300ER (Extended Range) jetliners. The order is valued at more than $2 billion at current list prices and bolsters Air China’s long-haul widebody fleet as it looks to expand its international network. China’s flag carrier continues to modernize its long-haul fleet to replace aging aircraft and plans to expand its growing network internationally. Air China currently operates a fleet 174 Boeing airplanes, including nearly all current Boeing production models, including the Next-Generation 737, 747-8 Intercontinental as well as 777-300ERs. With this new order, Air China will increase its unfilled airplane orders with Boeing to 90 units, which include orders for new 787-9 Dreamliners. The 777-300ER is one of the most fuel and cost-efficient airplanes in its class as well as the most reliable twin-aisle aircraft in the world. It also has the highest cargo capability of any passenger airplane in service. The 777-300ER will receive further improvements in 2016 designed to reduce fuel use by another two percent.